DoubleTwist, which makes two of the most popular Android music apps in the world (AirSync at #7 and doubleTwist player at #23), just entered the U.S. streaming radio market alongside Pandora, iHeartRadio, and TuneIn. DoubleTwist’s Magic Radio has the power to extend your library, playlists, and musical taste to over 13 million songs. We’ll get into that below. You’ll never see or hear an ad, which is why it costs $4/month via Google Wallet as an add-on to the regular DoubleTwist Player for Android, which should put it in front of plenty of people (as should the free seven-day trial). As with the rest of doubleTwist, this app is a powerhouse, but one feature in particular attracted our attention for the way it unites downloaded and streamed music. Whenever anything unites an “old world” feature (in this case, the ability to play downloaded music) with a “new world” concept like streaming radio to a portable device, we sit up and pay attention. Magic Radio from doubleTwist (which incorporates over 13 million songs from 7Digital and data from The Echo Nest, publisher of Evolver.fm) does so many things that if we went through them all here, you’d lose interest and check your Facebook. 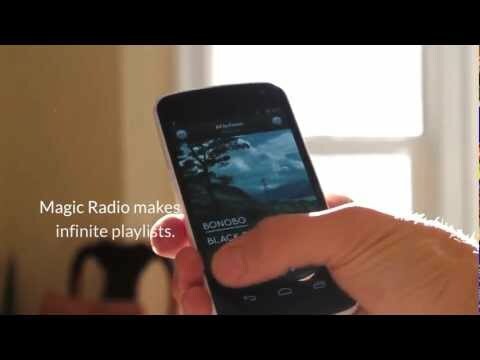 Simple enjoyment: DoubleTwist Player with Magic Radio turns the music on your Android into infinite, ad-free radio, among other things. Let’s just focus on one thing that Magic Radio does, because it’s so new. Any music fan worth a grain of digital salt has downloaded some music. They might even have made a few playlists over the years. And if they have an Android, their favorite music is sitting on their smartphone already, probably organized into those same playlist. This is the music that is arguably most central to our “musical identity,” or whatever you want to call it. Yes, you can download the entire Beatles catalog from Bit Torrent in a day or so. But which songs, albums, and playlists do you bother to sync to the thing you carry around all day? DoubleTwist Player with Magic Radio takes those songs, and those playlists, and those albums, and turns them into an infinite radio station that plays without ads. Even if you don’t even do anything, it creates one channel simply called “Music You Love,” based on the music you have. Of course, you can also create stations with artists and shape them with ratings (a la Pandora), or make stations with mood (a la Songza) or genre (a la TuneIn). Without those features, Magic Radio wouldn’t be worth $4 a month, even to serious music fans and existing doubleTwist users. But the feature that seems most attractive to this music fan is that automatic “taste extender,” or whatever you want to call it. the slice of a 13-million-plus-song music catalog that you’re likely to enjoy the most, available with a single tap.